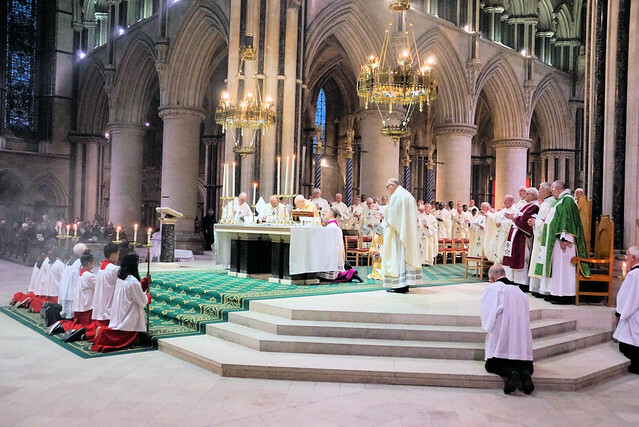 Over 1,000 people attended the annual Chrism Mass at a packed Cathedral of St John the Baptist in Norwich last night (April 16), during which priestly promises were renewed and sacred oils blessed. Keith Morris reports. In the biggest gathering in the diocesan year, Bishop Alan Hopes welcomed clergy and laity from parishes right across the Diocese, with coaches lining the nearby roads. In his homily, Bishop Alan said that at the heart of the Chrism Mass is the blessing of the three Holy Oils – the Oil of Catechumens, the Oil of the Sick and the sacred Oil of Chrism. “Oil is the outward sign of the Holy Spirit. The anointing in the Sacraments, is an efficacious sign that the Lord has touched our lives in a powerful way. “Oil also speaks to us of the person and ministry of Jesus Christ. Oil also says something about us – for we too are the anointed ones – Christians – people who belong to Christ – people who have a share in his anointing – people who have been filled with his Holy Spirit,” said Bishop Alan. “As we gather together today as the particular Church of East Anglia, I want to express my gratitude and that of the whole Diocese to both our priests and our deacons. I thank you for the generous and whole hearted way in which you continue to serve both God and his people so faithfully in these challenging times. Around 85 priests from across the diocese then renewed their priestly promises. This was followed by the blessing of the three oils. The Oil of Chrism, a mixture of olive oil and a sweet smelling perfume, is consecrated by Bishop Alan to be sent out to all the parishes of the diocese where it will be used in the sacraments of Baptism, Confirmation and Ordination and for the consecration of churches and altars. The Bishop also blessed two other oils to be sent for use in parishes: the oil used by priests in the sacrament of anointing of the sick and the oil used to strengthen catechumen prior to baptism. At the end of the Mass, the oils were collected by the seven diocesan Deans for distribution to their parishes. When the Mass had finished, everyone was invited to have a hot drink and a hot cross bun in the Narthex.